The post-World War II rebuilding of Britain resulted in a significant program of new church building projects, with many providing opportunities for contemporary artists to gain commissions. It wasn't only the construction of new churches, however, that provided scope for the commissioning of modern art. The need for repairs was also a contributing factor. 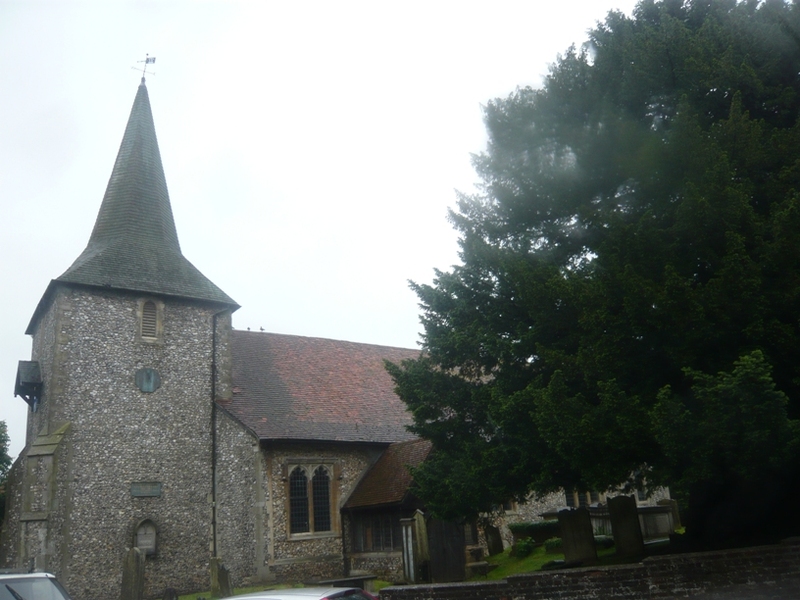 At St Mary the Virgin in Downe, the east window was completely destroyed in August 1944 when a bomb landed on the opposite side of High Elms Road. After the war the church applied to the War Damage Commission for funds to install a new east window and consulted with Robin Darwin, principal of the Royal College of Art, on which artists they might invite to submit designs. Darwinadvised throughout the selection process and Sir Jasper Ridley, a trustee of the Tate Gallery, also provided input. The result was the award of the commission to Evie Hone. David Morgan wrote that at that time ‘moving through the discourse of Modernism in art was a dominant conception of the sacred, one which distanced art from institutional religion, most importantly Christianity, in order to secure the freedom of art as an autonomous cultural force that was sacralised in its own right.’ However, despite this dominant narrative, some of the leading artists inFrance were also committed Christians exploring ways of reviving sacred art. Committed Christians themselves, Hone and Jellett went to France to study art. This was unusual, as they were both at that time members of the Church of Ireland (Hone later became a Roman Catholic). The two studied under Albert Gleizes, who was in the process of returning to the Catholicism of his youth. 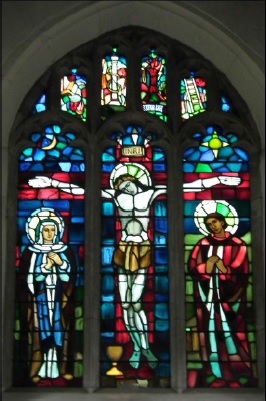 Hone’s Crucifixion at Downe, installed in 1950, is a bold and simple design with the crucified Christ on a red cross in the central light, his arms and those of the cross extending into the two side lights where Mary and John are located. Above are symbols relating to the Passion narrative. Blues predominate in the background, with the red of the cross repeating in St John’s robe and greens being used to further delineate St John and Mary. Unlike other Irish stained glass artists of her time, such as Harry Clarke and Michael Healy, Hone relied on the essential brilliance of stained glass to create her effects without the use of special techniques to create irradiation. Within the simplicity of the design, her focus is on harmonizing bold colours with the linked rhythms of interlocking lead lines. As James White suggests, the necessary data are ordered to the available space without irrelevant decoration distracting from the window’s central powerful focus. Considering that the brief from the parish had stated that the design ‘should aim at simplicity, and there should be an avoidance of any mass of detail,’ it is clear that they found the right artist for this commission. The impact of the east window is apparent on entry, as it dominates the interior. I arrived late and flustered after losing my way in torrential rain to be met by Sue King, a patient, understanding and very informative churchwarden. The records she showed me provided the background to the commission as well as reflections on Evie Hone’s work and legacy. Sue pointed out Robin Darwin’s wry comment about artist expenses in his correspondence over the commission: ‘If all artists were paid by a grateful public for the cost of painting pictures, which they fail to sell, they would have a fine time, but the country would rapidly go bankrupt.’ He recommended that the unsuccessful artists, including Leonard Evetts and Lawrence Lee, who had created designs for what was essentially an informal competition, be paid £2 for their efforts. As one who tries to ensure through my work with commission4mission that artists are paid for design work, I was pleased to see that this small compensation was given so that the ‘losing’ artists weren’t completely out of pocket. Sue also highlighted other 20th-century glass found in the church: the work of Keith and Freda Coleborn, both well-regarded artists, village residents and husband and wife. Freda’s panel is a copy of one in the Cathedral of Notre Dame at Dijon that has been placed in a window in the north wall, while Keith has two original designs commemorating members of the Knox-Johnston family. His Tree of Jesse (pictured below) shows Jesse, the father of David, at the bottom of his family tree, which leads up through all the human ancestors of Christ to Christ himself and to his monogram at the top. Keith’s other window commemorates the first solo round-the-world voyage under sail as undertaken by Robin Knox-Johnston in his vessel ‘Suhaili’. There is clearly much more to see and explore in Downe, not least its connections with Charles Darwin, but today, after a late arrival and a schedule that takes me next to Tudeley and windows by Marc Chagall, there is time for only a quick meal in The Queen’s Head, opposite the churchyard, before moving on through the rain. I carry with me, in my mind’s eye, the image of Hone’s imposing, expressive Christ, light streaming into life through his loving sacrifice. 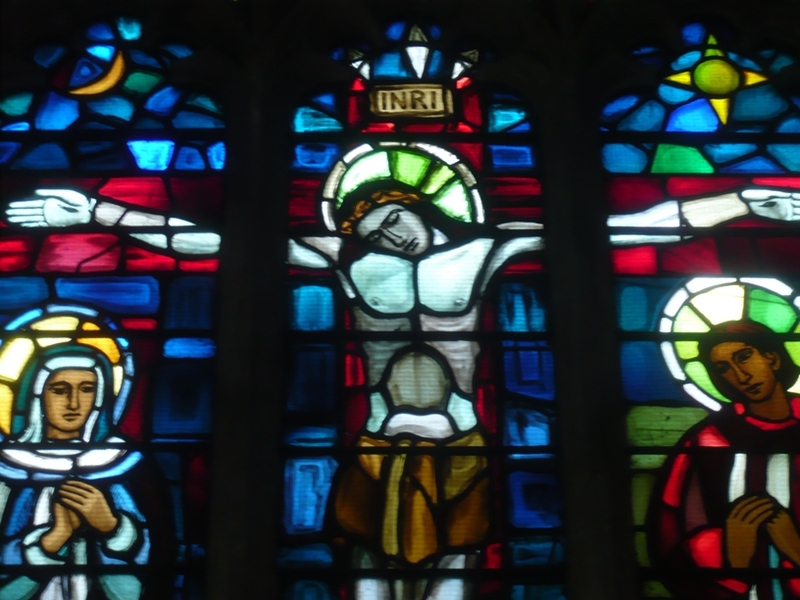 The second photo of Evie Hone’s Crucifixion window is used with the permission of St Mary's, Downe.